In the fourth installment of our 2017 Summer Postcard Series, Anna Thompson ’18 writes from Detroit, where she is participating in an American Cities Internship through Wellesley’s Career Education. Her internship is supported by the Joan Freed Kahn ’51 Bequest for Public Service Internships. I write to you as I wrap up my summer internship at Eastern Market Corporation. Eastern Market is one of the oldest and largest public markets in the United States, nourishing Detroit since the 1800s. The market operates Sundays, Tuesdays, and Saturdays, with Saturdays being the busiest. On those days, the five sheds that make up the market are full of local vendors selling fresh produce, flowers, meats, honey, and handcrafted goods. Eastern Market Corporation not only operates the public market, but also serves as the economic development corporation for the entire Eastern Market district. My projects as an Eastern Market intern have been wide-ranging: I have assisted with writing grant applications, development projects, grant recording, market event planning, and the operation of the public market on the weekends. I have attended planning meetings with the Michigan Department of Transportation, the Detroit Economic Growth Corporation, and the Nature Conservancy, allowing me to totally understand how the many stakeholders work together to create a safe, functioning, and sustainable city. The concepts I have learned in my peace and justice studies major and concentration in urban community development have come to life in Detroit. This summer marks the 50th anniversary of the 1967 Detroit rebellion. Throughout the summer, there have been many events in the city aimed at understanding the rebellion and its implications today. Most intriguing to me is exploring the role of urban design in healing and transforming a city post-trauma. In one week, I will be heading to New York City to begin a semester with an urban studies program in which I will be travelling to the major cities of New York, São Paulo, Cape Town, and Ahmedabad to research and explore urban justice and strategies to create just cities. My summer in Detroit has given me a foundation with which I can begin to think about justice and equity in a developing, global city. Here’s to discovering, or rediscovering, a sense of place and creating home, wherever you may be. Wellesley, I will see you in the spring! Anna Thompson ’18 is a peace and justice studies major. She will be taking over Wellesley’s Snapchat account Monday 8/7–Friday 8/11 and sharing details about her daily life and internship in Detroit. 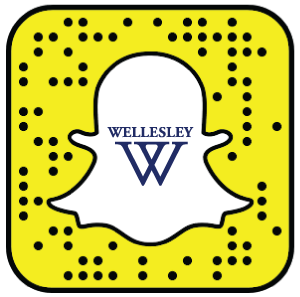 Add Wellesley on Snapchat to follow along.